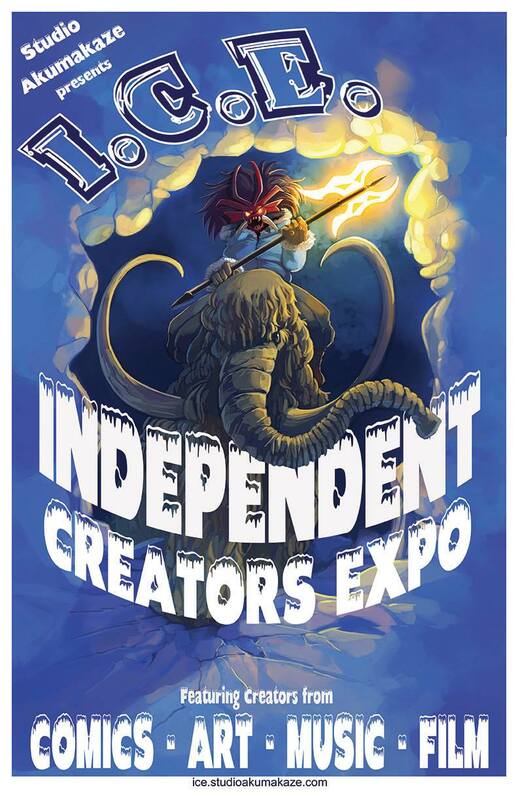 The Uncommon Geeks go to the Independent Creators Expo! On Saturday, Mrs. Uncommon Geek and I went to the Independent Creators Expo at Wright State University. This was probably the smallest convention/expo I have ever attended, but, despite its small size, it delivered in a big way! The Expo celebrated everything indy; from comics, art and music, to small press and film. As we walked into the Student Union at WSU, we turn to enter the expo, and we are greeted by our friend Spencer, who is working the registration table! Mrs. Uncommon geek asked, “Is that Spencer?” And I replied, “Yes it is!” We greet each other, pay our $3 entry fee per person, and we didn’t get but maybe 5 feet and we are greeted by another friend, Lisa! Dressed in Sailor Moon cosplay! She was there doing live painting and selling her work. We were told that in the music room, their was Marvel vs Capcom III set up in the music room, so we decided to go there first. We walk into the room, and the DJ’s who were set up were playing pretty good music. We get maybe half way into the room when one of the people at the Matsuricon table (where the Marvel vs Capcom was set up) complements Mrs. Uncommon Geek on her 4th Doctor scarf she was wearing! We talked to the nice lady from Matsuricon for a good amount of time while I played Marvel vs Capcom a little bit, then continued to check out the rest of the music room, then went on to explore the main expo space. The main expo space was right up our ally! The music room was nice and all, but we are more visually creative people. The main expo room was laid out perfect! The isle ways were wide enough to accommodate a good amount of traffic, unlike larger cons I’ve been to, and all of the creators actually looked like they wanted to be there, also unlike other cons I’ve been to. As we walked, checking out the awesome artwork, we spoke to some of the artists, creators, authors, ect. about their work. We wanted to by something from everyone, but couldn’t. I saw that Comic Related had their booth set up, so we stopped by and talked with John Wilson and his wife Kim for a bit. One of the tables we stopped by, Spencer was at! He was helping out some friends who work on a few comics called “Seven Sisters” and “SCRAP.” The artwork for both was amazing! Sitting down outside the main expo room, Mrs. Uncommon Geek and I took a few minutes to rest. We talked about some of the amazing artwork we say, and how she wanted to buy at least one of something from everyone there. I agreed with her. One thing I like about seeing independent work is how they take advantage of being their own editors, especially with comics. I will admit, I am not a big comic reader. Their are a few titles that totally pull me in, Green Lantern being the big box title, and TETHER being the most recent, but when I was yonger, my brother would get a comic from somewhere that was indy press. I snuck and read every issue he brought home. I think one of his friends was the creator, I honestly can’t remember. It was during my “I think I can build a robot, so let me take apart everything electronic and see how I can make the house explode” phase. But, talking with some of the authors, all of them said they LOVE being their own editors. It allows them the freedom of telling the story the way it is meant to be told. One of them went as far as to say they hate computer typed words. Someone wanted to run their comic in a publication and asked if they could redo the words with type. The artist reluctantly agreed, and said it didn’t look right. It’s interesting seeing the contrasts within the industry. Before we left, we bought tickets for Gem City Comic Con. I want to know more about the comic industry, specifically, the indy press side of it. I know quite a few of my friends know a lot about the industry, and one of them owns his own comic con. I feel that indy press comics will start to gain momentum, more so within the next 5 years than ever! I am interested in seeing where TETHER goes, both popularity and story wise, and I look forward to learning and seeing more.